How to live in the bubble called Earth? How to remain steadily on your feet even when the tectonic plates are shifting as we speak? If you can’t come up with an answer, let Nassim Nicholas Taleb enlighten you. The venerable and highly talented author of the ‘The Black Swan’, offers some comprehensive solutions for his readers; solutions that can come handy when your back is against the wall. In this era of instability, pandemonium has taken control of our domestic and professional spheres. Humanity takes pride in being ten steps ahead, but nature’s fury and other unfathomable elements drags man back to square one. The tutelage of Nassim can prepare you to tackle the worst case scenarios. 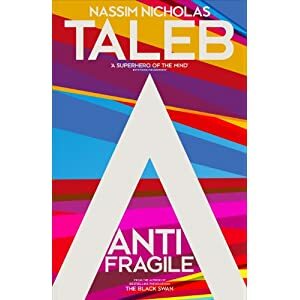 Nassim’s next and most recent work ‘Antifragile’, suggests ways to churn benefits from catastrophes. He supports his notion by presenting lucid arguments; completely germane to his theories. He cites the example of a colossal tragedy that grabbed the world by pliers. He terms the heart wrenching incident of Titanic, a wake-up call that made mankind more conscious and alert. Disasters like these compel us to roll our sleeves and get into the recovery mode. They inspire us to rectify our mistakes and strengthen our defenses for any unforeseen event, lurking in the future. His ideas may lead to bewilderment, but the pragmatism of his methods can’t be debated. Penning your resignation letter on the first day of your job indeed sounds insane, but you will gradually discover the import of his message, only if you are willing to keep an open and resilient mind.